Despite being on the wrong end of a one-sided looking score line, Wotton-under-Edge HC's new ladies team put in a spirited performance in their first ever fixture against a mixed team from local firm Renishaw plc. In this exciting new development for the club and the town, many of the women who had worked hard over the summer to get this project off the ground took to the field for the first time. Wotton-under-Edge Hockey Club is now fully behind the venture, after being approached by the group who, under their own initiative, had begun to organise training sessions in the spring. The team is now formally a part of Wotton-under-Edge HC and acts with its full support and relevant voluntary assistance from members of the men's section of the club. If the squad continues to develop at the same rate its intended that the team will enter the local league structure from 2006/07. Playing against a strong mixed side who regularly play together was a stern test for these players, the majority of whom had not played hockey for some time. Despite some stout defending in the opening few minutes by Rachel Nichols and Lucy, Wotton soon found themselves several goals down. However, the reaction to these early setbacks said a lot about the team's character and bodes well for the future. Based around the centre midfield pairing of skipper Vicky Carney and Hayley Perrett, Wotton mounted a brave rearguard action and either side of half time played some excellent hockey. Tammy Bradbury and Judy Collins provided a penetrating option down the right flank while Becky Stockley provided the vital link between midfield and attack. As Renishaw's greater experience and fitness told, Wotton leaked more goals but they eventually gained some reward for their efforts when Annabel Ellis coolly slotted the ball under the advancing keeper to give Wotton Ladies their first goal. Despite the score line Wotton should be congratulated on their overall performance with the level of enthusiasm and commitment superb throughout. 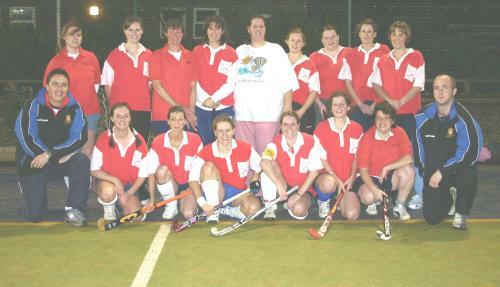 Any ladies interested in playing hockey for Wotton-under-Edge HC should contact Vicky Carney on 01453-842750. The next training session takes pace at Castle School, Thornbury - 7.30-9pm on Monday 21st November, with further friendly matches in the pipeline.